For all FAQ and information related to policy claims, kindly visit the 'Claims' Section of our website. Every single policy document is shipped through Speed Post. Leveraging the Pan India network of 154,227 post offices, it provides the most robust option by ensuring swift deliveries at urban locations and fastest last mile delivery link in semi-urban/rural geographies. A policy surrender request once processed cannot be reversed. The benefits of your policy will cease upon surrender of your policy. Kindly ensure that all other options including partial withdrawal have been evaluated prior to requesting for policy surrender. You may surrender your policy after the completion of a lock-in period as specified in the terms and conditions of your policy by submission of a duly filled and signed Surrender Request Form, your savings bank account details, a cancelled cheque leaf from the account, policy document and self-attested copy of KYC documents at the nearest branch location. The request for surrender will be processed in 7 working days after receipt of the request subject to fulfilment of all requirements. Kindly refer to the policy terms and conditions for the surrender charges applicable in your policy. 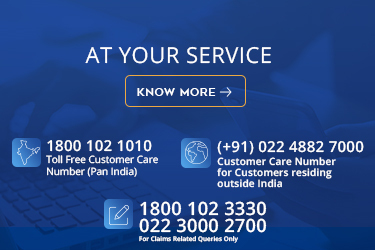 A Unit Statement for your ULIP policy can be requested through our IVR by calling our toll free number 1800-102-1010 or can be downloaded from our self-help portal on this website. The statement will be mailed within 2 working days from the date of request or it can be issued at your nearest branch immediately upon request. You may change your nominee any time after the policy issuance by submitting completed and duly signed Nomination Form and self-attested copy of KYC documents (Address and ID proof of the nominee) at the nearest branch location. The change of nominee will be updated in our records within 2 working days after receipt of the request and complete documents at our branch. A policy may be assigned after issuance by submission of a complete and duly signed Assignment Form (including notice of assignment), original policy document and self-attested copy of KYC documents (Address and ID proof of the assignee) at the nearest branch location. Kindly refer the terms and conditions of the policy to ensure that assignment is allowed in your policy plan. The assignment will be effected in our records within 7 working days after receipt of the request and complete documents at our branch. The premium payment frequency may be changed on your policy anniversary date (the date in the corresponding year on which the policy was issued) by submission of a duly signed request. The frequency change will be reflected in our records within 2 working days after receipt of the request and complete documents at our branch subject to the request being received 15 days prior to the policy anniversary date. ECS addition in your policy will be processed on submission of completed and duly signed ECS/ Credit Card Mandate with a cancelled cheque leaf or credit card copy as applicable at the nearest branch location. The change of payment mode will be reflected in our records within 15 working days after receipt of the request and complete documents at our branch subject to approval from the drawee/card issuing bank. Rider addition can be effected on any policy anniversary date, post issuance by submitting completed and duly signed request submitted at the nearest branch location. This is subject to underwriting approval. Any rider addition or deletion will be reflected in our records within 7 working days after receipt of the request and complete documents at our branch. You can switch the fund allocation in your In Force ULIP policy any time after issuance by submission of a duly signed request at our branch. The switch can also be reflected by logging in to our Self-Help portal on this website. The switch will change the existing fund allocation as desired by you. In order to change the allocation of future premiums, kindly request for a Premium Redirection in addition to the Fund Switch. The Fund Switch will reflect in your policy (with applicable NAV of the Request date) within 2 working days after receipt of the request subject to fulfilment of all requirements. You can avail a loan against the policy after the completion of a lock-in period as specified in the terms and conditions of your policy by submission of a completed and duly signed Loan Form, your savings bank account details and self-attested copy of KYC documents at the nearest Branch location. The request for loan will be processed in 7 working days after receipt of the request, subject to fulfilment of all requirements. A partial withdrawal can be made after completion of lock-in period as specified in the terms and conditions of your policy by submission of a completed and duly signed request form, your savings bank account details, a cancelled cheque leaf from the account and a self-attested copy of KYC documents at the nearest branch location. The request for partial withdrawal will be processed in 7 working days after receipt of the request, subject to fulfilment of all requirements and in accordance with the terms and conditions of the policy. You can change your correspondence address post issuance of the policy by submitting a written request and address proof at the nearest branch location. The address will be reflected in our records within 2 working days after receipt of the request and complete documents at our branch. Find all the important documents you need right here.